This post originally appeared on the LSE’s British Politics and Policy blog. Amidst crisis and austerity the radical right is in flux. Whereas populist radical right parties have devoted more than three decades to an electoral strategy, recent years have seen the emergence of ‘counter-Jihad’ groups, which are more confrontational, chaotic and unpredictable. Examples include the various defence leagues or Stop Islamization movements. They are surrounded by an amorphous network of ‘think-tanks’ and blogs, which have influenced activists who moved into violence, notably Anders Breivik. Counter-Jihad groups differ from the populist radical right in three ways. First, they prioritize demonstrations over elections, as in Britain where the English Defence League (EDL) has staged over 50 protests that often entail large costs. Meanwhile, in France Generation Identity occupied a mosque to demand a referendum on Muslim immigration, and compared followers with the ‘68’ers’, claiming to represent a generation saddled with unemployment, debt and ‘multicultural decline’. Second, they have ‘unbounded’ memberships, whereby activists flow in and out. Some are from far right circles but others are connected to hooligan firms, and most are organized through social media. The EDL once claimed over 80,000 followers on Facebook, while Generation Identity launched on YouTube. They often reject crude ‘whites-only’ supremacism, appealing to minority communities. Recently, Stop Islamization of Denmark marched in support of a Jewish community that recorded an increase in acts of discrimination. Third, rather than offer a broad program, counter-Jihad groups focus heavily on the ‘threat’ from Islam. While the populist radical right has infused its discourse with anti-Muslim prejudice, counter-Jihad activists show little interest in issues beyond Islam, which is framed as threatening the resources, identity and way of life of the native group. It is striking, then, how little we know about the roots of support for these groups, which are under-researched and poorly understood. With evidence absent, popular stereotypes flourish. The groups are often dismissed as by-products of the crisis. Some, like journalist Daniel Trilling, argue that the way to counter their appeal is to ‘break the death-grip of austerity’. Others contend they reflect a reservoir of politically alienated and apathetic youth. But are they really bastions of unemployed and uneducated young men who are reacting to economic insecurity, or giving up on democracy? To probe these questions my project with Chatham House worked with YouGov to survey 1,666 British adults and 300 supporters of the EDL. These are citizens who (i) have heard of the EDL and know what it stands for, and (ii) openly agree with its values and/or methods (the full report is here, and a more technical academic paper is here). Among those who had heard of the EDL (n=1282), a striking 24% agreed with either its values and/or methods. But who are they? Our results suggest that some of the best-known stereotypes are inaccurate. Support is not anchored among the young. Most of those who endorse the EDL are over 44 years old. Only 16% are 18-29 years old. While they share low levels of education, less than one out of every ten supporter has no qualifications whatsoever. Nor is this simply rooted in the working class. More than half of the EDL supporters in our sample are in professional, managerial and routine non-manual occupations. 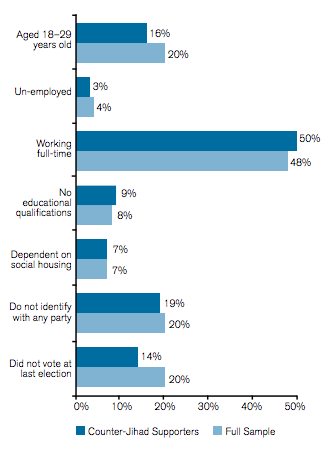 Those who agree with the EDL are no more likely than their fellow citizens to be unemployed, or in social housing. These groups are routinely portrayed as an outlet for unemployed and uneducated young men, but the picture is far, far more complex (see Figure 1). Nor is there much evidence to support those who cite political disengagement. Supporters of the EDL (and remember, we are not talking members) are no more isolated or apathetic than their fellow citizens. They were more likely to vote at the 2010 general election, but were less likely to refuse to identify with one of the three main parties. Most identified with the Conservatives: 46% of them voted Tory in 2010, compared to 20% who voted Labour. While they were four times more likely to vote BNP or UKIP, only 8% of them did so. Furthermore, while EDL supporters are certainly more dissatisfied than most with the way that democracy is working, only a small minority think that the system is broken beyond repair (see Figure 2). So, what is driving their support? Foremost, the EDL supporters in our sample are profoundly concerned about immigration and rising ethnic and cultural diversity, amidst which Muslims appear to represent only one of several ‘threats’ to national identity and ways of life (for a more sophisticated analysis demonstrating the centrality of xenophobia see our academic paper). They rank immigration as the most pressing issue facing the country, above the economy and ‘Muslims in Britain’, a distint third (see Figure 3). These concerns are deep and intense. They are also wrapped in extreme pessimism. Counter-Jihad groups frame their narratives in apocalyptic terms, offering a vision of a society in which groups are embroiled in communal violence, and where violence may be needed to protect the native group from ‘militant Islam’. These narratives are reflected in our findings. Large majorities of EDL supporters feel strongly that the rising number of Muslims in Britain, who now comprise the fastest growing religious group in the country, poses a threat: 82% see birth rates within Muslim communities as a threat to British national identity; and 80% view the growth of these communities as a threat to the survival of white Britons. Eight out of every ten EDL supporter endorses the ’clash of civilizations’ thesis, which lies at the core of counter-Jihad thinking. Those who agree with the EDL are also more likely than their fellow citizens to view violence as justifiable: 37% think that violence ‘against extremists’ could be justified, compared to 21% nationally. 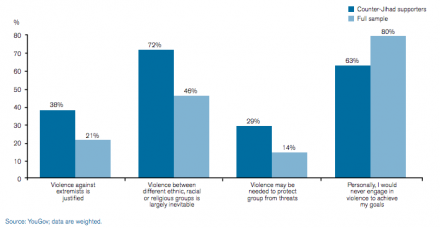 Similarly, the number believing that violence may be needed to protect their group from threats is almost two-fold higher than the national average (see Figure 4). There is little evidence, then, to support those who trace extremist groups like the EDL to economic inequality, austerity or political isolation. Instead, what we find is a pool of citizens who feel profoundly under threat from immigration, who see little to gain from rising diversity, and who are deeply pessimistic about the future of society. Calming and unpacking these deeply held anxieties is one challenge for policy makers going forward. Undertaking further research on these groups and their more strongly committed supporters is another. But as we elaborate in the report, until now many of our basic assumptions appear to have been flawed. Far Right Violence: What Do We Know? Is it possible that the link between austerity and far-right support is stronger than Dr. Goodwin suggests and “concerns about immigration/diversity” is, for some, just a proxy for these economic insecurities? If Yougov were to survey me I’d probably put “economy” and “immigration” as the two most important political issues at the moment. However the latter is just a proxy for the former. I wouldn’t be too concerned about Bulgarian/Romanian immigration were we not already in an economy with 2,500,000 looking for work.